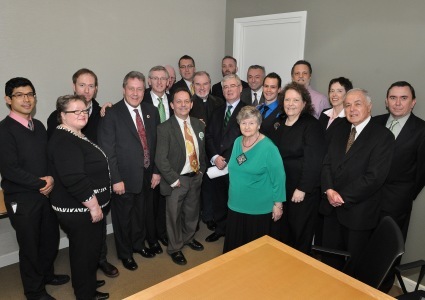 Picture from Merrionstreet.ie of Tanaiste Gilmore meeting emigrant rights groups and Irish gay rights groups. While Enda is busy wowing everyone in Washington with the fact he can put one word after the other and smile, the visit by Tánaiste and Minister for Foreign Affairs and Trade, Eamon Gilmore to New York may escape notice. Gilmore is set to meet Hilary Clinton and review the St. Patrick’s Day Parade in Manhattan. Yes that parade. Irish Queers are again protesting the exclusion of LGBTs from the parade and also highlighting the support for the parade from the New York Police Department and other bodies. The Department of Foreign Affairs amongst other issues has responsibility for emigrant affairs – not all of the emigrants it seems as applications for funding and recognition by LGBT groups have been declined by Irish consulates over the years and Ministers have continued to attend the New York Parade despite the homophobia. You may remember that President Mary McAleese turned down an invitation to be the parade’s Grand Marshall this year, neatly sidestepping any row. I wonder what Minister Gilmore will do to recognise the exclusion of lesbians and gay men from the parade. Or will he just ignore it? And if you are new to this – the potted history – the New York St. Patrick’s Day Parade is deemed to be a private event and is run by a group called the Ancient Order of Hibernians. Irish American LGBT groups have sought to take part in the parade for nearly 20 years. They have been denied entry and have engaged in campaigns of civil disobedience and battled through the courts. (An alternative Parade in Queens is open to all groups). Meanwhile politicians and US and Irish public bodies continue to take part in the AOH run New York parade, and Irish LGBT groups took part in parades in Ireland without a bother. Over to you Minister.